Southeast Alaska’s native culture, abundant wildlife and coastal history comes to life on a three-hour bus and boat tour that leads you to Tongass National Forest, Totem Bight State Historical Park and Guard Island Lighthouse. A 20-minute bus ride through Ketchikan offers a glimpse of Tongass National Forest, the largest forest in the United States, plus the original Wards Cove Packing Company salmon cannery and the abandoned floating village known as Loggerville. Then join a professional captain and crew aboard a sightseeing boat for a scenic cruise through the Vallenar Rocks Wildlife Viewing Area, home to bald eagles, harbor seals, whales, deer, guillemot and other seabirds. 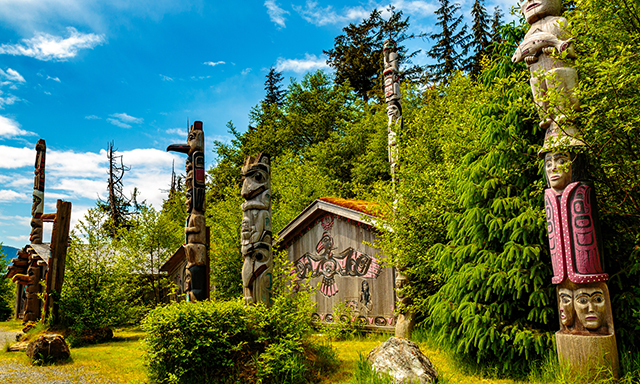 Explore Totem Bight State Historical Park, an 11-acre oceanfront expanse where you’ll discover a collection of 14 towering cedar totem poles that were hand-carved by local artists in authentic Tlingit and Haida styles — the onsite Clan House is typical of an early 19th-century Alaskan Indian village. Top off your exploration with a cruise by Guard Island Lighthouse, one of Alaska’s most accessible lights, as you listen along to harrowing tales of its storied past overlooking the entrance to the Tongass Narrows from 1904 until it was shuttered in 1960. • Ketchikan: See Cove Packing Company’s defunct salmon cannery, abandoned Loggerville’s floating homes and tons of wildlife at Vallenar Rocks. • Totem Bight State Historical Park: Explore a Tlingit Clan House and view colorful totem poles carved by Southeast Alaskan artists. • Guard Island Lighthouse: From 1904 until 1960 this wooden tower offered light for sailors entering the Tongass Narrows. • Eagles: This is Alaska's premier Eagle viewing excursion with 10 Eagle's nests, abundant Eagles, and baby Eagles in season. • Guests must be able to walk approximately 75 yards over level surfaces, with inclines and about 15 steps and extended periods of standing. • Wheel chair service from the bus to the vessel provided and crew will assist all guests with limited mobility. • Each vessel has two lavatories. • A few days per season stormy weather prevents the vessel from safely reaching the lighthouse. On such days extra time viewing eagles will be spent in protected areas.